Not every culture has contact with the tortoise which is generally a land animal. In places where the tortoise is unfamiliar, the turtle usually fulfills that symbolic slot. When the First Being of the Indian cosmogony, Prajapati, wants to have a child, he becomes Lord of the Waters -- the tortoise, Kashyapa. All the matter of the universe is borne by his body. The area of Kashmir is named for him. In the Himalayan Buddhist astrological context, the tortoise is an aspect of Manjushri. As in the Indian view, it supports the universe. It is depicted, its head to the south, floating in the primordial ocean which surrounds and bathes the various continents. In a new cosmic cycle, the chaotic substance is dried by the winds, and liquid ingredients separate from solid ones. Then, Manjushri emanates this enormous tortoise and causes it to float on the primordial sea. In his wisdom, he recognizes the need for a solid basis and so, rising into the atmosphere, he lets fly a golden arrow, which strikes the tortoise in its right side. This causes it to turn over and sink, dripping blood from its wound, excrement from its body, and vomiting fire. These substances increase the proportion of elements dissolved in the waters so consolidation is able to occur. That furnishes the foundation for the universe, and it comes to rest upon the tortoise's flat underside. About the chart and Tibetan astrology. A Mongolian detail is, that near the end of this creation, the golden tortoise which supports the central mountain, Sumeru or Meru, suffers from the extreme heat of the sun's last moments. Turning over in its agony, it brings about the end of the world. Link to image of Stone Tortoise at Chinggis Khan's capital, Karakorum. 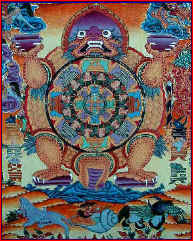 Nu Kua, Chinese creator-naga, uses the toes of the cosmic tortoise for the 4 cardinal directions. These became four animals: To the North, ruling over winter, is a Black Tortoise referred to as The Black Warrior. It represents the yin principle and the element, Water. In a variation of the Chinese cosmogony, P'an Ku [pinyin: Pangu], assisted by the dragon, the phoenix, the unicorn and the tortoise, creates the universe after emerging from the Cosmic Egg. This tortoise, one of the celestial emblems, is the symbol of longevity and wisdom. Its shell is the vault of the heavens. The union of the Tortoise and the Snake engenders the universe. Another Far Eastern myth says that there is a gigantic tortoise in the depths of ocean. It has one eye in the middle of its belly. Once every three thousand years, it rises to the surface and turns over so that it may see the sun. In Classical [Greek and Roman] mythology, the tortoise is sacred to both Aphrodite and Hermes, deities associated with sexuality. This may be because of the gradual action of the tortoise's head as it emerges from the shell, and also that it was thought to possess both female and male characteristics. In fact Amazonian Indians, views it as representative of the female genital opening. Almost diametrically opposed to this sexual symbolism is its use in Christian imagery as a symbol of modesty. Hinduism views the retraction of the head into the shell as indicating an advanced spiritual state -- a conscious turning inward as if the tortoise were meditating. The second of Lord Vishnu's 32 avatars, or forms which he takes in order to act in the physical world, is that of the Tortoise. This is Kashyapa, Old Tortoise Man, the progenitor of all living creatures. In the Jataka Tales, stories about the Buddha's former lives, at least two feature a tortoise: The Talkative Tortoise and The Tortoise That Refused to Leave Home. According to The Collected Records of Immortals ("daoist folk-customs" 4-6-14, a HK website no longer found online) the Queen Mother of the West is called Nine-Soul Great Sublimity Golden Mother of Tortoise Mountain, or the Great Void Nine-fold Glory Golden Mother of the Tortoise Platform. In the iconography and terminology of Tibetan Buddhism, she is Vetali, the golden goddess of the West who is depicted holding aloft a tortoise. Ison (Eka Obasi, Obasi Nsi, Ibibio) is the West African goddess, "The Tortoise-shelled" who symbolizes the earth. Tortoise shell is a very durable substance - the first plastic, we could say. It symbolized a flexible permanence, and was used on Chinese court sashes to signify high rank. In Europe and America, well past the 19th century, it was still being used as a decorative veneer on furniture, boxes and other luxurious items. Tortoise shell played a role in the development of writing. Not only was it heated to produce a network of cracks that were interpreted for divination [plastromancy,] but the earliest Chinese characters [Shang dynasty, before 1000 BCE] were found scratched on tortoise shell. Unfortunately, many of these ancient tortoise carapaces were ground up as "dragon bone medicine." Aeschylus (525-456 BCE), famous playwright of ancient Greece, is said to have been killed by a tortoise which hit him on the head having fallen from the talons of an eagle flying overhead. Remember, often no distinction is made between tortoise and turtle. Kashyapa: Also a name associated with the Buddha prior to Shakyamuni. turtle: Generally a tortoise is the term for the animal that lives exclusively on land. A turtle is amphibious.